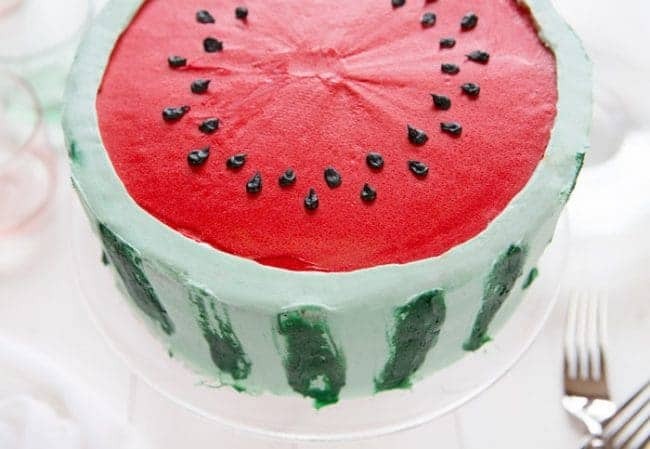 This is a watermelon cake inside and out! 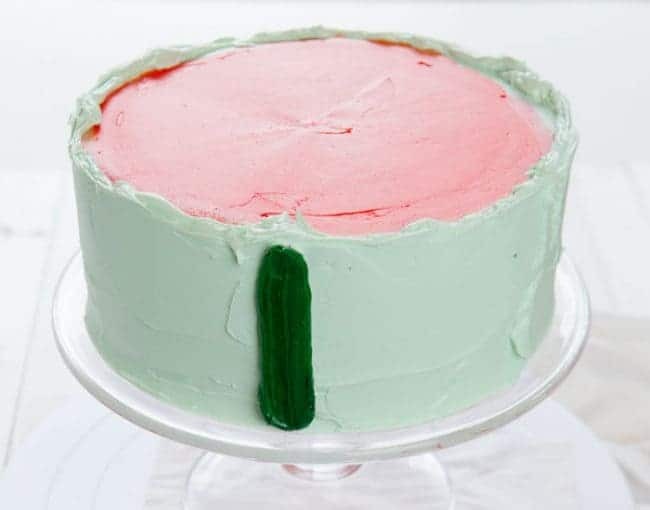 I used real watermelon to flavor this cake and then used buttercream to create a simple design on the outside. 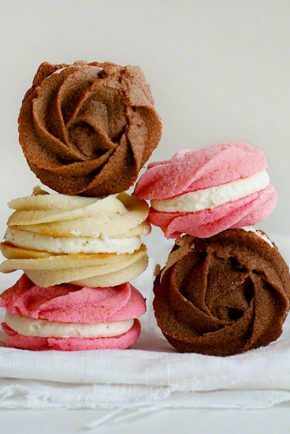 Fun and delicious! 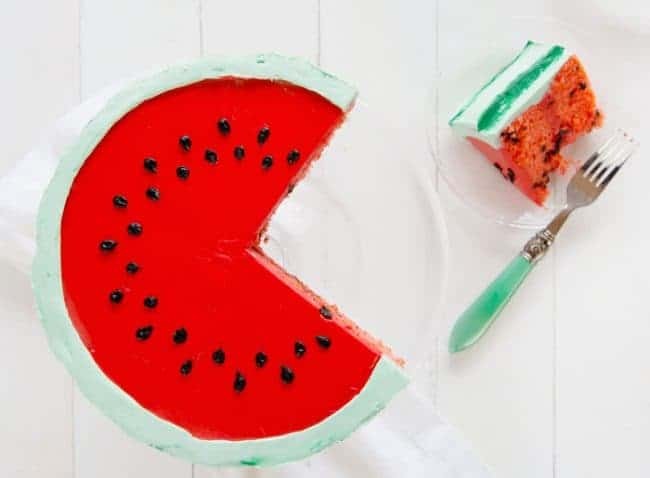 I wanted to create a from-scratch watermelon cake that had a fun design inside as well as out! 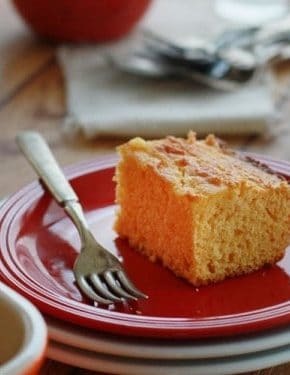 A few simple ingredients are all you need to recreate this summertime cake that is perfect for any party and 4th of July barbecue!! Make a well in the center and add butter, watermelon juice, strawberry extract, eggs, and red food color. Beat with a hand mixer on medium speed for about 1 minute, or until ingredients are fully incorporated. Sift 1 cup of chocolate chips with 1 tablespoon flour and then gently stir into batter. Pour batter into prepared pans, dividing equally among both. Equally divide about 1/4 cup chocolate chips between the two cake pans. (The remaining chocolate chips will be used between the layers of the cake when you frost it.) Bake 20 to 30 minutes or until toothpick comes out clean. Cool in pans on wire racks. When cakes have cooled completely, turn out onto wire racks. 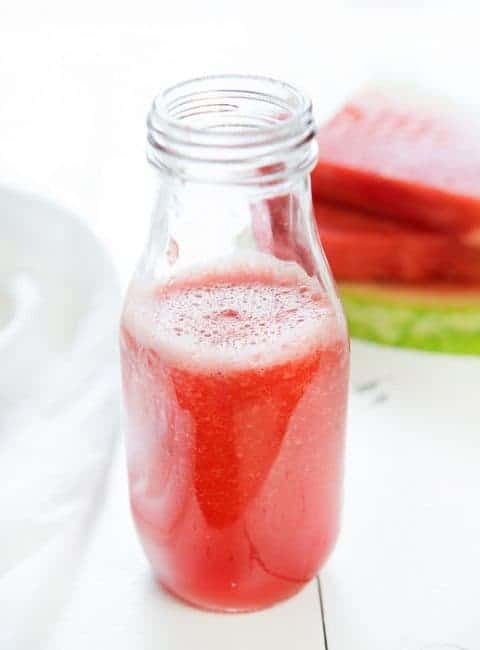 * To make watermelon juice, simple cut about 1/4 a medium size watermelon into chunks. Place in blender and puree until smooth. 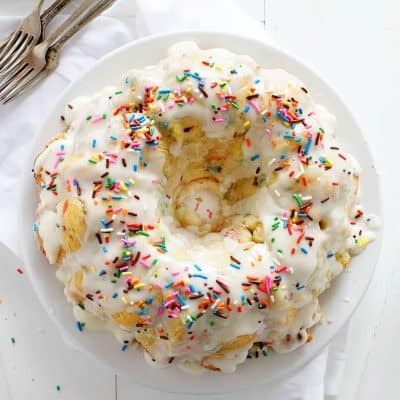 Begin by making the cake. 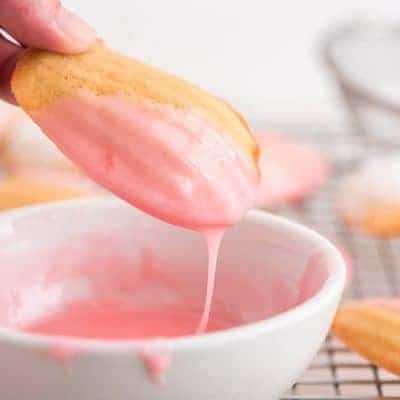 You will notice that I add watermelon juice to the batter. This is simply watermelon that I have pureed in the blender! 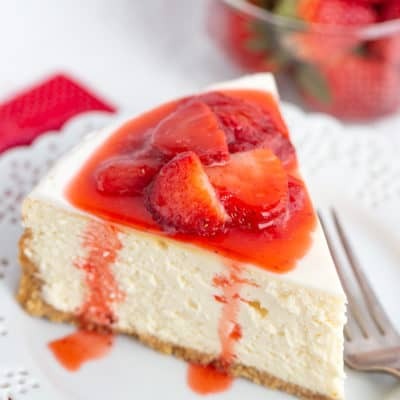 You may also notice that I added a bit of McCormick® Strawberry Extract. I found that when I added just a little it seemed to enhance the watermelon flavor. 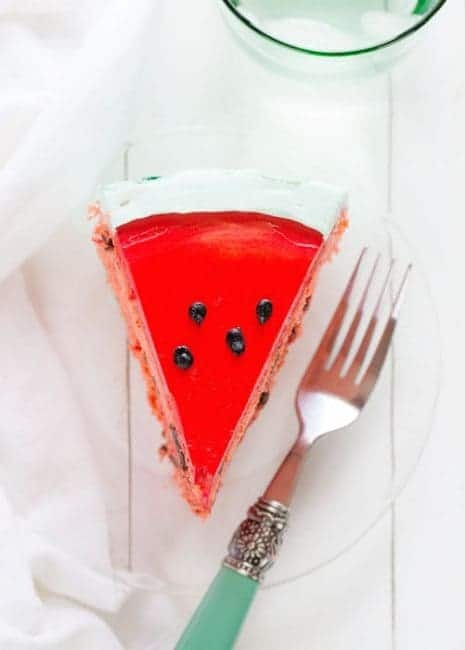 I also believe there is something about “eating with our eyes”, so when people bite into this cake, they tend to match the sweet “berry” flavor to that of a watermelon. It’s quite fascinating! 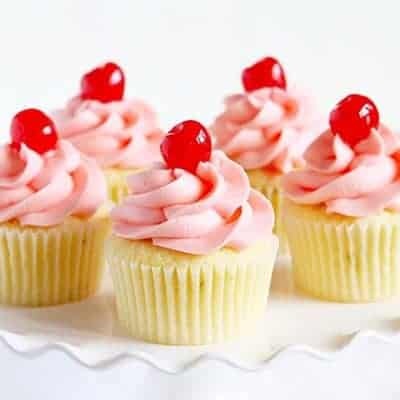 After cakes have baked, allow them to cool. I separated my frosting into 2 bowls. The first bowl I tinted a light green. (about 3 drops of McCormick® Green Food Color.) The other bowl I then divided again. 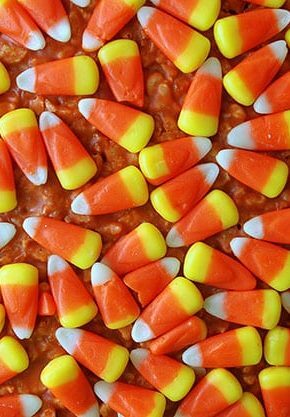 One portion was tinted red with McCormick® Red Food Color. I used about 2 teaspoons. The final portion of buttercream was tinted a dark green, I used about 2 teaspoons here as well. After I piped the green lines on the cake (I will show you how in a moment) I tinted the remaining green frosting black. Because it was already dark, I used very little black food color. Set the first layer of cake on cake stand. Evenly spread about 1/2 cup of the red buttercream over the top of the cake. Place other layer of cake on top. 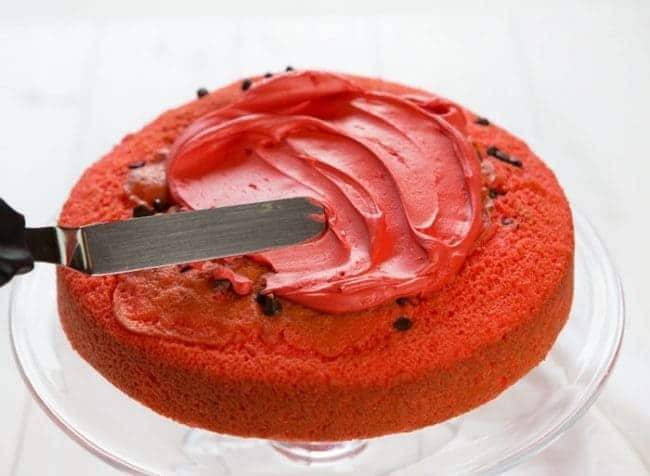 Spread about 1/2 cup of red buttercream around the top of the cake and smooth as much as possible. Now spread a thick layer of the light green buttercream around the sides of the cake. 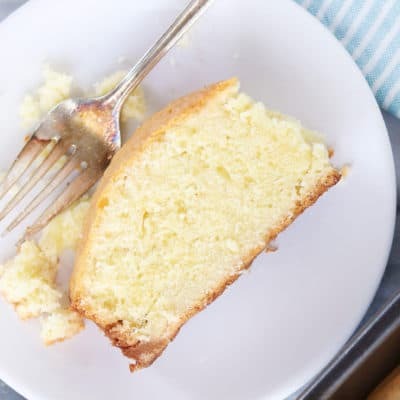 You may need to do a crumb coat, chill the cake, and add more light green. 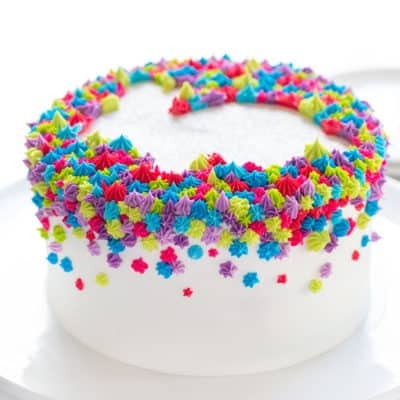 You do not want to see the cake underneath or crumbs in the frosting. 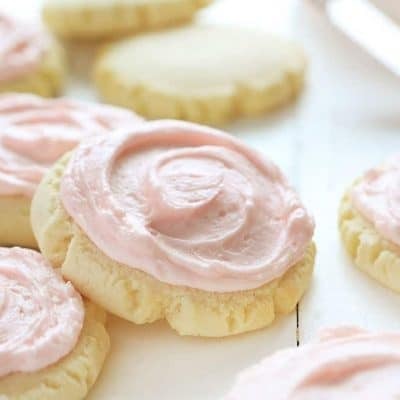 When swiping up I would also then remove the excess frosting from my spatula so as to not smear the next line too much. Do this around the entire cake. 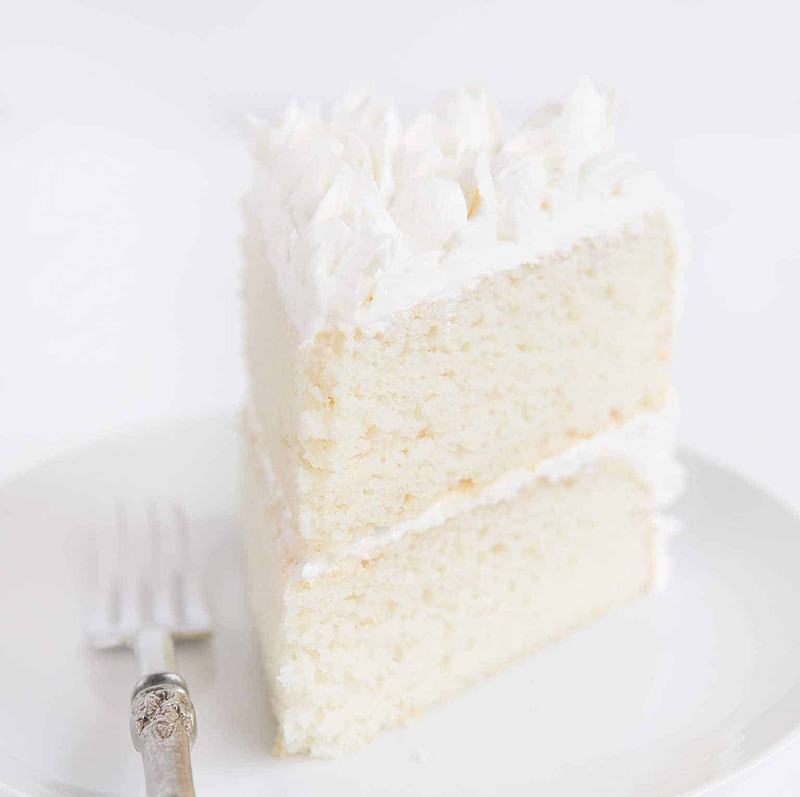 When done, carefully go around the entire cake and smooth out the top edge. 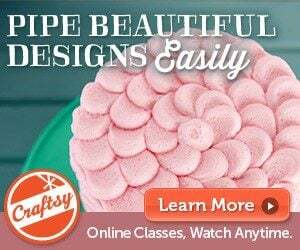 Now get your black buttercream and put it into a pastry bag fitted with a #3 small round tip. Pipe out little black seeds around the top of the cake. You can do as many as you want and any size you want! If you want to make one row of seeds but slightly bigger, I would switch to a #5 or #7 tip. If you want a nice clean crisp slice, chill the cake before cutting. The cake tastes great at room temperature as well as chilled. Using freshly pureed watermelon juice works best. 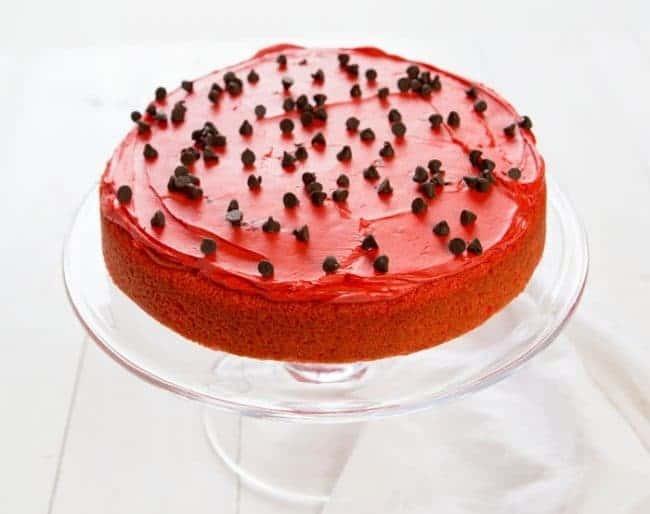 I tried to match my red buttercream to the color of the cake. 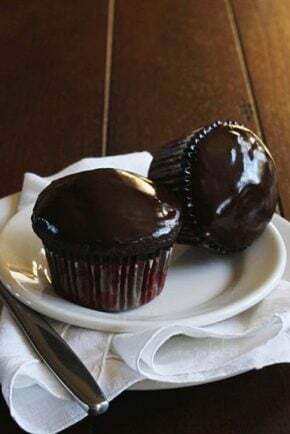 This works best if you tint your buttercream after the cake is baked. Be sure to sift the mini chocolate chips in flour so that they do not all sink to the bottom of the cake. I also added a few on top of the batter just before baking. 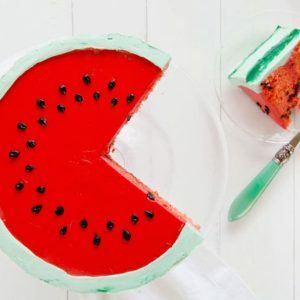 I hope you love this From-Scratch Watermelon Cake recipe! 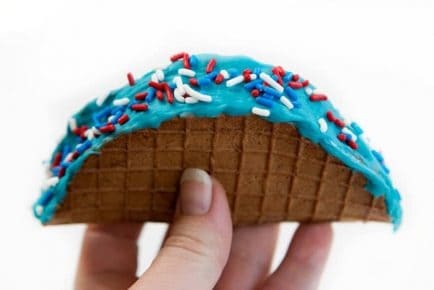 Want other tips and tricks to make a flavorful 4th of July? Check out McCormick’s recommendations a delicious no bake treat like Firework Poke Cake or Chocolate Chip Cookie Dough Stars. Thank you so much for choosing to support the brands that support iambaker. McCormick is an amazing company who takes great care in providing the best quality product and I absolutely love working with them. Feel free to visit them on social media and follow along in the fun! 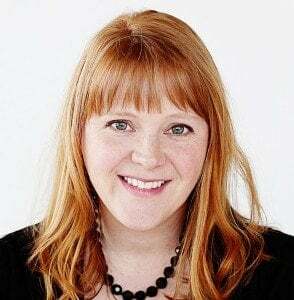 McCormick on Facebook, Instagram, and Pinterest. This cake just makes me SO HAPPY. LONG LIVE SUMMER! You truly are so ta;enter and have a good imagination to go with it. Amanda, you are uber-talented!!! One cake more amazing than the last! Thank you so much for always sharing your gifts with us! 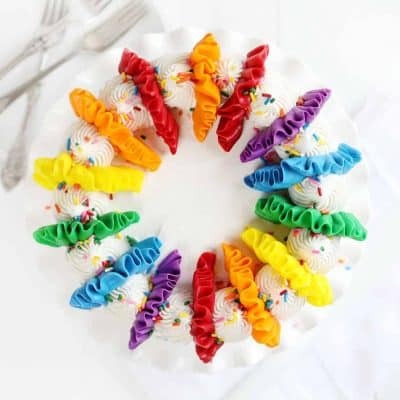 What an incredibly adorable idea for a perfect summer cake! 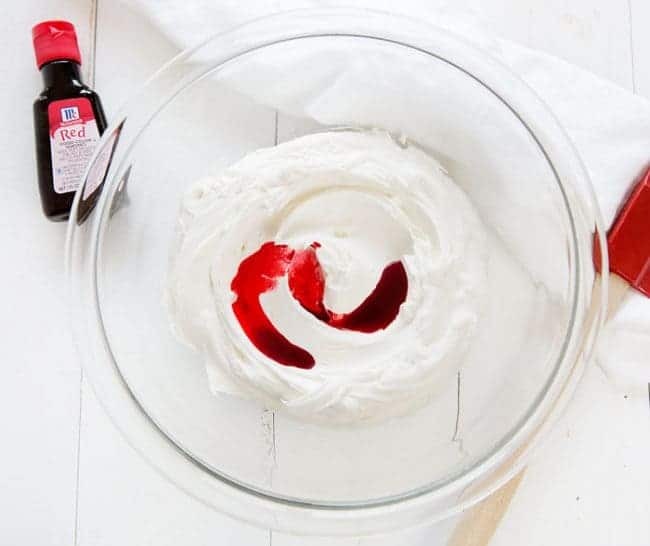 This looks like a delicious and cool dessert for the summer! I am going to try this one! My daughter got so excited when she saw this post because watermelon is her absolute favorite thing in the world to eat. Naturally she wants it for her 7th birthday at the end of August. How “watermelon-y” does it taste? My husband is dubious that she’ll actually like it. I asked her over and over again if she wants it flavored or just colored vanilla cake. She’s determined to have it flavored. I’m super curious to see how the others that tried it came out as well. TIA! It’s a subtle flavoring! 🙂 But delish. 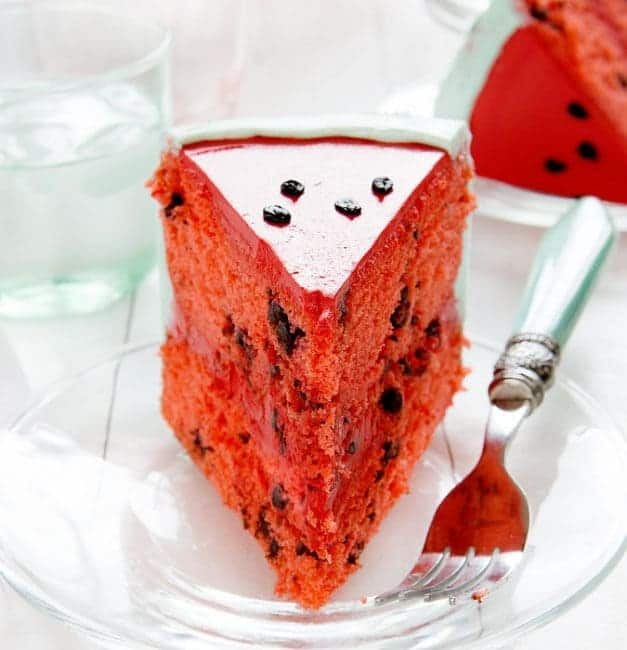 This is watermelon cake looks yummi and healthy! Definitely love your dessert and I’ll try it! I found your post from Pinterest! Thanks for sharing, Amanda! This is an exciting cake for a summer party. I may try it for a party this week. 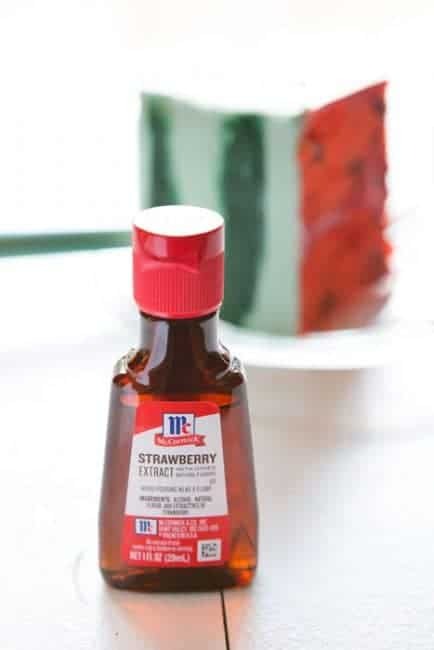 I have LorAnns Watermelon Oil that I’m going to try in place of the Strawberry Extract. 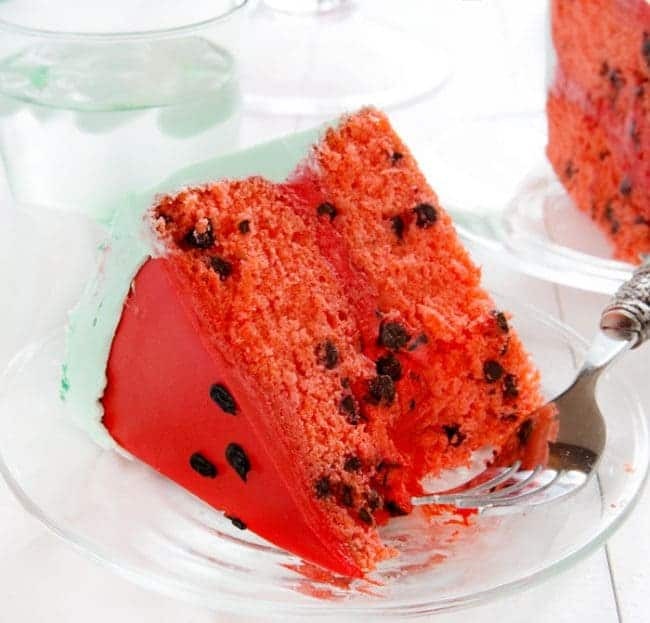 That watermelon cake is the food of champions! Dying to eat this! Thanks for posting it, Amanda!